This post has no real substance except to show off some pictures, but let's get rolling with it anyway. I took this picture after dragging myself all the way to Roppongi, which is a neighborhood with a pretty bad reputation, to go see a movie at the Tokyo International Film Festival. Roppongi is sort of like the Japanese Hollywood. Lots of rich people, and particularly rich foreigners, live there, and occasionally you can see famous actors and actresses, not that I would know who any of them are. So in a way it's pretty upscale, but it also has a seedy side. Lots of people come there to go clubbing, and supposedly there's a lot of cheap places, but they're really sketchy. From what I've read, a lot of the human trafficking in Japan goes on in Roppongi. Roppongi or Kabuki-cho, which is basically the red-light district of Shinjuku. Two places I plan to generally avoid. But as long as you stay out of the clubs in Roppongi, you're probably okay, and the movie theater where the Tokyo International Film Festival was held was freakin' upscale. They had student tickets for 500 yen, half-price, but you couldn't reserve them in advance, so by the time we got there, the tickets for Albert Nobbs were already sold out, so we ended up seeing a different movie, Kaliphah, instead. It was interesting but it wasn't amazing. The director Q&A at the end helped me appreciate it a bit more, though. It also made me want to go back home for True/False. Maybe next year. I've missed that film festival too many times since high school. Anyway, I was pretty grouchy after finding out that I couldn't go see Albert Nobbs, so I snapped this picture and grouched to myself that seeing Tokyo Tower all lit up was the only good thing about stinking Roppongi. I think the next day, I went to Shinjuku with my friend, who studied abroad at Knox when I was a freshman. She wanted to show me the observatory where you can get a free view of Tokyo. Terrible picture, but my family probably wants to see photos with me in them. Tokyo is ridiculously huge. Even though I was looking at these buildings with my own eyes, I still couldn't really grasp how many there were. I'm not in the Midwest anymore, folks. Does this look familiar? Yep, it's just like the one in New York, but it's in Shinjuku. My (Japanese) friend was like "Ugh, I'm so sick of Japanese people, they think they're so cool, but all the do is copy things!" It's a funny comment because historically Japan has imported a lot of its culture from other countries (China, the US, other Western countries) and then made it its' own, and Japanese commentators have been torn as to whether this is Japan's way of adapting or Japan selling itself short. Western commentators tend to have been on the side of "Japan should focus on its' own culture! Kimono and Zen are beautiful! Japanese wearing Western clothes is just vulgar!" even if it made people's lives more convenient. We went to a cafe, and I got a heart drawn in my coffee. Ahaha. I've still never had real cappuccino. This was something called a "Flat White." Which was somehow different than cappuccino. They had cappuccino on their menu but I guess they couldn't draw designs in it or something? 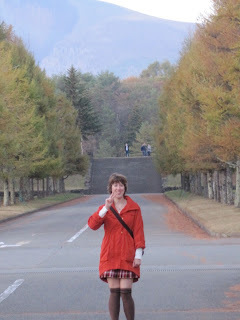 Next on the Japan Study agenda was a trip to Karuizawa in Nagano, because Waseda has facilities out there that we can use. It was awesome to get to see mountains, but we were watching a movie on the bus so I didn't take a picture of them like I should have. The whole trip was largely disappointing. We couldn't leave until after classes on Saturday and then we had to get back by dinner time on Sunday, so we didn't have much time to do anything. Plus it was freezing cold, and they made us wake up early on Sunday morning. The whole trip was basically just to get us all together so they could tell us about the cultural practicum choices, but we did get to have a little Halloween party on Saturday night. Honestly, the highlight for me was watching ダリーンは外国人, Dariin wa Gaikokujin, My Darling is a Foreigner, on the bus, which was a really cute film about a relationship between a Japanese woman and an American man. It's based on a comic series about the author's marriage, so the characters actually seemed believable. The plot was predictable, but hey, you need some cute, feel-good fare every once in a while. It was actually what inspired me to rent some Japanese movies. Next, my sister came to visit Tokyo for the weekend! It was stressful because I was performing with my dance club in the Waseda festival that weekend, but it was a lot of fun at the same time. We went to go see a Takarazuka performance, which is an all-female musical theater revue, which means that women play both male and female roles. It's a lot of fun because, since the men are women, they're more beautiful than real men, and the women are more beautiful than real women too. The whole thing is really spectacular and over-the top and dramatic. The performance we saw had two parts. The first was the actual play, called 仮面の男, Kamen no Otoko, The Man in the Mask, and it was a really difficult to follow story about this power struggle between the king of France and his twin brother, who was exiled and made to wear an iron mask so he couldn't take over the thrown. Or something. The second half was this crazy Las Vegas themed dance performance called Royal Straight Flush, which had more glitter than I've ever seen in my entire life. I don't get to see a lot of high-budget musical theater, so seeing how they could stage things with absolutely no limits was pretty awesome. There was this scene where everyone was gossiping about the king, and all of the court ladies had these hand puppets of bright red lips that they first stuck out from off stage and then became part of the musical number. And there was a cute scene where Phillipe, the exiled twin brother, and the girl he was falling in love with, were doing shadow puppets of the tortoise and the hare to show that Phillipe still had the opportunity to take the thrown, and they used the stage lights to project the shadow puppets on the screen and make it look like the light was coming from Phillipe's lantern. I think in the future, if I have enough money, I want to go see another play that isn't set in ye olde France, so that the male characters look less like the female characters. 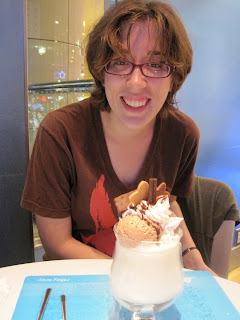 On Saturday night, the highlight was a restaurant in Ikebukuro called Milky Way, where they have parfaits. 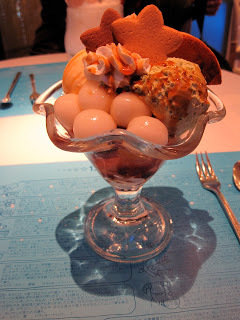 You can often see girls in anime eating these huge delicious-looking desserts, so we were dying to try one. Milky Way was great on a rainy Saturday night, because it didn't actually close until 10pm but it wasn't very crowded. The whole theme of the place is obviously, the stars, so they had horoscopes on the place-mats as well as a parfait for each sign of the zodiac. It was really cute. Plus since they weren't busy, they kept refilling our water glasses, so we felt pretty free to just sit and catch up for a while. Relaxing places like this are hard to find in Tokyo. So are places where they refill your water glass. For some reason Japan tends to be stingy about the beverages. This was the parfait for my zodiac sign, Taurus, and I wanted to try it mostly because it had dorayaki sticking out of it. Dorayaki is basically anko red bean paste in a pancake, and we'rd been talking about Doraemon, th famous blue earless cat from the 22nd century who loves dorayaki, in my J-pop class, so I wanted to try and eat some. Besides the dorayaki, it had shirotama (I think that's what they're called?) - the chewy white squishy things in the foreground, green tea flavored cream, anko, vanilla ice cream, the star shaped cookies at the top tasted like ginger snaps, and the bottom was anmitsu, which is a Japanese dessert that's a lot like a fruit cocktail. So despite its hugeness, this thing was actually pretty light. My sister got a chocolatey one. I forget which zodiac sign it was. It looks huge, but the outer cup is full of dry ice, so it was steaming when it came to our table. The inner cup with the actual parfait in it is a lot smaller. Even in the beginning of November, it was beginning to look a lot like Christmas in Tokyo. Here's me, in front of the game center across the street from Milky Way, posing with this giant stuffed Rilakkuma, decked out for Christmas (Rilakkuma's name means "relax bear," from リラクス "rirakusu" and くま"kuma," meaning bear. The Japanese "r" can be romanized as an r or an l).